Your Google+ news feed shows most updates. In each circle, web marketers can adjust the volume of updates you receive from people in that circle. Once you have become an expert with Google+ and have tons of friends and followers, the update volume may get a little overwhelming. You could also want to see more from certain circles. Adjust the volume to whatever suits your company. Click the Home icon to go to your news feed. At the upper right, you’ll see a little slider bar. Slide the bar to adjust the volume. Slide it all the way to the right for 100 percent. Slide it all the way to the left for no updates. Adjusting the update volume is a great way to customize what types of updates you see in your default news feed on Google+. 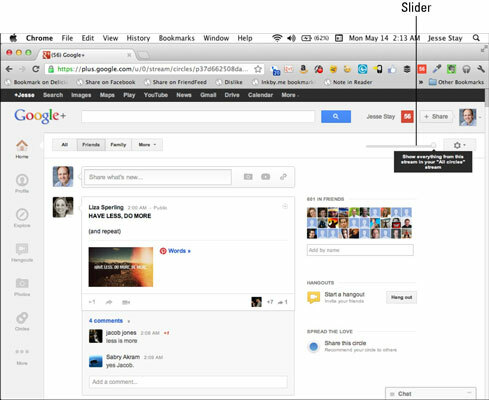 The farther to the right you adjust the little volume slider, the more updates Google+ will insert into your feed. If you turn the slider all the way to the right, you’ll see not only every update in your news feed, but also an e-mail notification for every update that comes from people and brands in the circle.